Athletic trainers are vital practitioners in the delivery and advancement of health care. 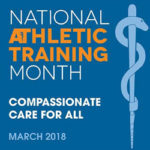 Athletic trainers are an integral part of the inter-professional health care team uniquely qualified to treat sports injuries on and off the field. At DOC, we proudly support the men and women of the athletic training profession as they work toward creating and maintaining a safe and healthy environment for America’s athletes.